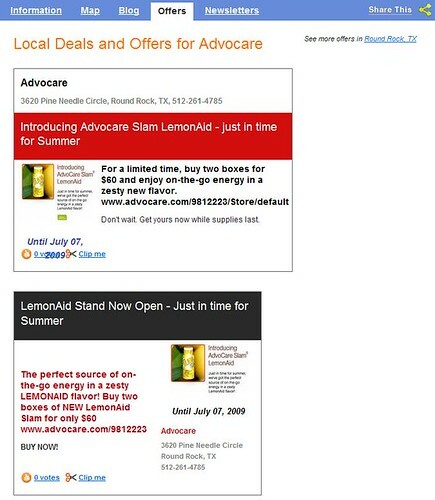 MerchantCircle member Brad Loveland, owner of Advocare in Round Rock, TX, has been using his Twitter account recently to Tweet sales and promotions from his MerchantCircle page. Posting deals and specials to Twitter is a great way for businesses to gain followers on Twitter. You can create promotions here and sales here from your MerchantCircle dashboard and coupons here. It's all free! Nice work, Brad! You can follow MerchantCircle on Twitter too: http://twitter.com/merchantcircle.